Volunteering holidays are increasingly popular and have become far more organised and accessible to people of all backgrounds and ages. They are a fantastic way of travelling to some exotic locations, meeting up with like-minded people and putting your skills to good use or indeed learning some new ones. But make sure it's a life experience you'll never forget for all the right reasons. With so many options now available, make sure you research and select carefully where you want to go and the best way you can help a disadvantaged community. Think about what you can offer and bear in mind your health and well being too. Once you have made your decision, get adequate travel insurance to cover the full length of your stay, all of your destinations and activities. Specialist travel insurers will often arrange of cover for specific activities. If there is any chance you 'might have a go' at something while you are away get it included in your quote. You should also tell your insurer if you have any pre-existing medical conditions, if you are receiving treatment or taking medicines so that you can get appropriate medical travel insurance. Even if you will be in an organised group for much of your holiday, do still take all the personal precautions you normally would. 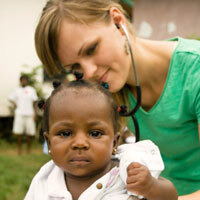 Find out where the nearest medical facilities are and what they provide. Always carry copies of important travel documents with you such as your passport, tickets and insurance and only a small amount of money and a single credit card. Be careful about what you eat and drink. Where hygiene and water quality is poor stick to steaming-hot foods, fruits that you peel yourself, bottled (especially carbonated) drinks, hot coffee or tea, beer and wine. Do not eat raw fruit and vegetables that you do not peel yourself, raw or undercooked seafood or meat, unpasteurized dairy products, or anything from a street vendor. Also, do not drink tap water, drinks made with tap water, or with ice made from tap water, or unpasteurized milk. Remember, taking out travel insurance is not a license for irresponsible behaviour. All travel insurance companies expect you to act sensibly and in the same way you would if you were not insured. One of the thrills of a volunteering holiday is being at close quarters with people from an entirely different culture. Do respect their codes and traditions of living, so you can live and work harmoniously together. However long your stay, you will learn a huge amount about the place you volunteer in, meet some fantastic people and return with holiday memories you will cherish forever.